Nowadays, culture and civilization are among the most important factors defining the nations in our world, and whenever a nation wanted to rebuild itself, inevitably it returned to these premises. Muslim countries did not stay away from resorting to this method in the continuous historical process of rise and fall of civilizations. Through our history there were many cases of the rising civilizations that eventually reached to the state of decline. Although Islamic civilization went through the whole process from the birth to decline, it reappeared again in the quest for revival. Development of the Islamic civilization in the various regions of the world is an amazing process which attracted attention of many researchers. Its origin can be considered a complex and inimitable phenomenon that along with the rapid growth was able to offer humanity a guidance for moving forward and due to its religious component – spiritual advantages before the other civilization models. Now that 15 centuries passed after the birth of Islam and the Muslim civilization, it was well accommodated in various places and nations of the world. Indeed, Muslim world can be compared to the Iranian carpet that with all its diversity of colors and geometrical patterns symbolizes unity altogether. It is exactly possible to witness this unity when all the patterns are analyzed in a composition next to each other. With the logic same as the carpet, Muslim world has a mesmerizing diversity of cultures, languages, ethnicity, religious sects, and yet it cannot be looked at without the lenses of unity, disregarding the sectarianism that may seem to tear it apart, because it has a uniting unchangeable principle that lies in the religion and has no substitute. If to distinguish the models Muslim nations may adhere to on the basis of where from they inherited Islam, it can be roughly divided into Arabic, Turkish and Iranian that were supplied as both religious and cultural package. However, there is only one Islam in the world, but an impression of its extreme plurality, when viewed within the national, cultural, linguistic frameworks it exists in. Any place Islam reached to, it was accommodated to the culture and spirit of the people while enriching it. What united all these lands is that the message of God transmitted to the Prophet Muhammad (pbuh) was voiced there. Domains of Arabic culture, Persian culture, Turkish culture, African culture, Indian culture and the culture of the Malay world in the Southeast Asia along with the other representative elements compose the civilization block of the Muslim world. Iran played a significant role in the spread of Islam in the Central Asia, Indian subcontinent and East Asia from China to Malaysia and Indonesia. Arab and Iranian traders, Indian Sufis introduced Islam to the Southeast Asia in the 13th century. Regional cultural abode of Islam consists of Indonesia, Malaysia, Brunei, Malay-speaking minorities at the South Thailand and Philippines which altogether account for 250 million people. In this region, as well as on the Indian Subcontinent and anywhere where beliefs penetrated through Iranians, it acquired a strong shade of Tasawwuf (Sufism). If to look for the political factors that helped to shape Muslim civilization, the Arab language that spread all over the Muslim lands, was one of them, and after that it gave its place to the Persian. Persian language as a driver of spreading Islam in Iran itself, Central Asia and Indian subcontinent also became widely spoken in various dialects at that time. As a result, the role of Arabic was reduced to the performance of solat and other prayers. Iranian influence is noticeable through the Malay language (that served as a lingua franka for the Muslims of Indonesia and Malaysia), as well as Thai language (from 16th century and Ayutthaya time). Quite a research was made on the Iranian influence in the Malay and Chinese world before the advent of Islam, but there was no consolidated work touching on all the aspects in their complexity. The role of Iranians in the spread of Islam among the people in this region is also of interest and issue for disputes between the researchers. Therefore, based on the outlined matters of interest, it is suggested to organize an academic seminar on “Civilization and cultural heritage of Iran and the Malay world” with the focus on Malaysia. Religion, religious sects, culture, history, philosophy, and literature are among the categories to be presented at the conference. This conference will provide a forum in which old debates can be discussed through new perspectives where fresh development and new theoretical and methodological approaches are anticipated to be the result of the conference. 0940 – 1000: Welcoming Speech by …..
A Meccan-born Malaysian has taught at The National University of Malaysia (UKM) for 24 years and Sultan Idris Education University (UPSI) for 14 years. He studied M.A in Comparative Islamic Literature at The University of Chicago. His CPhil and PhD is in Comparative Sufi Literature from The University of California at Berkeley. His main field is Comparative Islamic Literature. And his fields of research and teaching are Malay-Arabic manuscripts, Arabic-Malay-Arabic translation, Arabic, Persian, Arabic script (Jawi) system (spelling and calligraphy), Islamic arts, and Islamic civilization/history. He writes poems as well as literary criticism, translates creative works and literary studies from English, Arabic, Persian, and Turkish into Malay. He has written many articles, book reviews, published in newspapers, magazines, journals, and encyclopedias. Among the books written/translated by him are Qasidahs in Honor of the Prophet; The Ocean of Unity: Wahdat al-Wujud in Persian, Turkish, and Malay Poetry; Cerpen Kritikan Puisi Arab – Parsi – Turki: Segugus Pilihan dan Terjemahan (Arabic, Persian and Turkish Short Stories, Literary Criticism, and Poems: A Collection of Selected and Translated Works) [bilingual]; and lately Bandar dalam Puisi: Esei & Kumpulan Puisi (Cities in Poetry: Essay & Collection of Poems) [a newly created genre – in Malay it is called ESKUP (Esei + Kumpulan Puisi), meaning essay + collection of traditional/modern poems, containing a comprehensive essay on the main theme of the poems + a collection of poems by the scholar/poet himself]. Obtained many awards, among them are Malaysian Prime Literary Awards (Essay/Literary Criticism) [1998/1999], and Lifetime Writer Award (Lirerary Works Award Darul Ridzuan V (2016). Amir Hossein Zekrgoo is an art historian of Islamic & Oriental Arts, an artist and a scholar of comparative religion. Besides English he has studied Persian, Arabic, Urdu, Turkic, Hindi and Sanskrit. Professor Zekrgoo is a member of the Iranian Academy of Arts and of the Iranian Academy of Sciences, the Islamic Manuscript Association (TIMA) and honorary member of All India Arts and Crafts Society. He has been engaged in teaching art, history of art, philosophy of Islamic & Oriental Arts, and comparative studies in religious and sacred arts since 1982. He has to his credit 12 books and over a hundred articles on subjects such as Islamic art of calligraphy, Manuscript Studies, Indian philosophy and mythology, oriental art and iconography in English, Persian and Urdu in respective journals. In 2001 he moved to Malaysia and joined International Islamic University Malaysia (IIUM) as a professor of Islamic and Oriental Arts. Syed Farid Alatas, is an Associate Professor of Sociology at the National University of Singapore (NUS). He also headed the Department of Malay Studies at NUS from 2007 to 2013. He lectured at the University of Malaya in the Department of Southeast Asian Studies prior to joining NUS. His areas of interest are historical sociology, the sociology of social science, the sociology of religion and inter-religious dialogue. Among his recent books are Alternative Discourse in Asian Social Science: Responses to Eurocentrism (Sage, 2006), Ibn Khaldun and few others. He is the Academic Advisory Board for the Asia West East Institute. Larry is currently an Associate Professor. He is an ethnomusicologist, composer and music educator. Larry studied the guitar and specialised in Japanese shakuhachi, Balinese gamelan, Arabian ‘kd, and the Malay gambus (lute). Larry studied BA (Hons) in Music at Dartington College of Arts and MA in Queen’s University of Belfast (Great Britain), Teacher’s Certificate and Certificate in Education from Croyden College and Oxford Brookes University in Britain. His doctorate is in Ethnomusicology from the University of London. He has been presented three times with the “Excellence in Teaching Award” by the university. Larry is an internationally known scholar and he has presented research papers at many international conferences. His research has been published in Vietnamese Institute of Musicology, Philippines Ethnomusicology Journal, Asian Musicology Journal Vol. 3. And Vol. 6. Korean Educational Journal, Desacatos journal in Spanish and in the British Galpin Society Journal. Larry has also co-authored two secondary school music textbooks Exploring Music 1 and 2, which were widely used in most Singaporean schools. Mahmoodreza Esfandiar, Associate Professor of Islamic Azad University, has a PhD in Comparative Religion and Mysticism from Islamic Azad University. He is presently the Chancellor of Islamshahr Branch of the Islamic Azad University. Prior to this, he had held several teaching positions in various universities in Iran. He has published several books and articles in his area of specialization which is Tasawwuf and manuscript studies. Husain Heriyanto completed his BA program in agro-industry department at the Bogor Institute of Agriculture (IPB) and then graduated his MA degree in philosophy from University of Indonesia. he completed his PhD program in philosophy from University of Indonesia with putting forward a new school of thought in philosophy. He has taught logic, epistemology, philosophy of science, introduction to philosophy, history of philosophy and science, environmental philosophy and ethics at a few departments of University Indonesia, Paramadina University, and the Islamic College for Advanced Studies (ICAS) Jakarta. He established a research centre, the Avicenna Centre for Religion and Science Studies (ACRoSS). He also established RGGI (Raindrops Group for Green Indonesia). Since 2013, as a senior researcher of Sadra International Institute .Since 2003 he has been teaching Environmental Philosophy (Filsafat Lingkungan) at Postgraduate Program of Environmental Studies, University Indonesia. Dr.Bastian Zulyeno is a Member and Lecturer at the Department of Arabic Studies, the Faculty of Humanities in University of Indonesia. He conducted his PhD thesis titled: “The Translation from Malay Text to Persian of Taj al- Salatin, Book by Bukhari al Jauhari from the Seventeen Century A.D. and its Comparison with Siyasat Name by Khauje Nizam al Mulk al Thousi ” in Language and Persian Literature, Faculty of Humanity the University of Tehran, Iran. 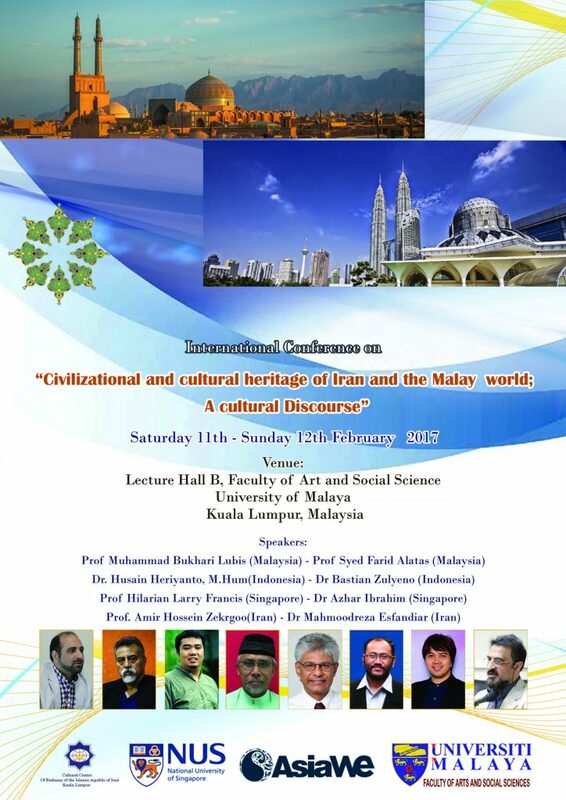 Azhar Ibrahim,is a Lecturerat the Department of Malay Studies National University of Singapore ( NUS ). He obtained his PhD. MA, from the same Department in 2002 and 2008 respectively. His dissertation focused on the humanism and intellectualism among Malay literary intelligentsia while his MA thesis dealt with the study of religious orientations as reflected in feudal Malay society and its continuities in the present. He majored both in Malay Studies, and Southeast Asian Studies at undergraduate level. He has been a Lecturer for almost ten years at the National Institute of Education, (NIE) Nanyang Technological University, teaching classical and modern Malay literature, sociology of the Malays, as well as Islamic intellectual traditions and civilization. At NIE he also co-teach multiculturalism and critical pedagogy. His research interest includes sociology of religion, sociology of literature and critical literacy, and the Malay-Indonesia intellectual development. Currently he is pursuing his post-doctoral research at the Faculty of Theology, University of Copenhagen, Denmark for (2009/2010), and later at Temple University, USA (2010/2011) under the NUS Overseas Postdoctoral Fellowship. His postdoctoral research focuses on Social Theology in Muslim Southeast Asia: Trends and Challenges, and the Theology of Dialogue in Malay-Indonesian Societies: Prospects and Impediments. He has co-edited and published widely in Malaysia and Indonesia. Dr. Hamideh Molaei is an Assistant Professor at the Department of South and East Asian Studies, Faculty of World Studies, University of Tehran. She conducted her PhD thesis titled Social media and politics: Examining the effectiveness of social media for social movements and political discussions in Indonesia in the Department of Media and Communications, the University of Sydney, Australia. Her interest is on the Internet and political participation in Southeast Asia. Her other interest is intercultural communication and she published several papers in this area. She has bachelor and master degrees in social communication sciences from the University of Tehran, Iran. Leyla H. Tajer graduated from International Institute of Islamic Thought and Civilization (ISTAC), International Islamic University Malaysia (IIUM) in 2014 with a PhD dissertation on “The Ingredients, Stages and Experience of Love: A Parallel Exposition of Jalaluddin M. Rūmī and Ananda K. Coomaraswamy.” She received IIUM’s Postgraduate Award for the Best Student for Doctor of Philosophy (Islamic and Other Civilizations). She continued the same line of research doing a Post-Doctoral program at ISTAC, IIUM. Her Master’s degree was in Comparative Religion from the Azad University, Tehran, Iran, in 2008. She knows Arabic, Persian and English and has abiding interest in illustrated manuscript of Sufi literature, especially Love Lyric manuscripts. She has recently joined University Islam Malaysia (UIM) as a researcher for Global Wisdom Academy. Elham Sadat Mirzania Has been born in 1977, in Abadeh a central city in Iran. Has studied Chinese Language and Literature at Shahid Beheshti University as her bachelor. After graduation she has moved to China to continue her studies at Beijing University and in 2009 has taken her Ph.D. in Chinese Modern literature. From 2014 has been teaching Chinese language and literature at Allameh Tabatabaei University in Tehran. She has written some books like China Under the Pen of Persians, Chinese – Persian Dictionary and some translated books like Chinese Contemporary Culture, Iranian archeology which published in China, also some articles like Chinese Teaching and Studies in Iran, Iran and China on the Textbooks of these two countries, Xi Dao Tang and some other articles in the cultural relations between Iran and China. Neda Zoghi is a PHD student in Art in Academy of Islamic Study of University Malaya. She works predominantly in Iranian Islamic Illumination, but includes Persian Miniature Painting for years. She was responsible for scheduling training classes and seminars also for Visual Arts and Islamic Illumination training in Calligraphers association of domain of art in Iran. She completed MA in Visual Arts at the University Malaya in KualaLampur in 2014. She has had numerous solo and group shows in Iran, United Arab Emirates and Malaysia. Faezeh Rahmanis a member of the academic board of Indian subcontinent and Southeast Asia studies department at the Encyclopedia Islamic Foundation, Tehran, Iran. She is a PhD candidate in Comparative Religions and Mysticism at the Islamic Azad University, Tehran, Iran(from September 2014).Faezeh also held a Master’s degree in Comparative Religions from the Islamic Azad University in 2011. She has published several peer-reviewed scholarly journal articles and presented afew lectures in her area of specialization which is Tasawwuf and Islamic studies in Malay World. She knows Arabic, Persian, English and basic Malay languages.